Not ready to upgrade your phone yet? Simply fill in a couple details and complete our survey below. 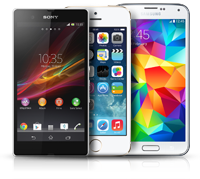 We'll contact you when the time is right and give you a great price on your next mobile phone contract. Yes, please contact me when my upgrade is due. We use partners from within the mobile phone industry to contact you about your upgrade, please tick here to confirm. Your data will not be shared outside of our partners. thank you for your time we'll be in touch when it's time to upgrade your phone!